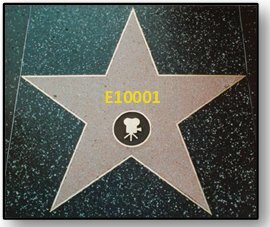 For weeks and weeks (or months and months really), we’ve been going on and on about the star of our J-2X project, development engine E10001. And there is every reason to focus much of our attention on this first example of our new engine. 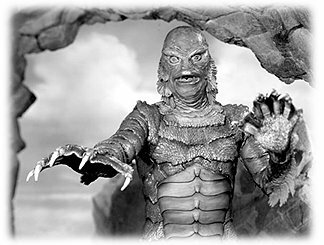 It has really put on one a heck of a show, generating oodles of data, and we’re far from being finished with it. See? As I said, you simply pull off the whole thrust chamber assembly and there you go: powerpack. 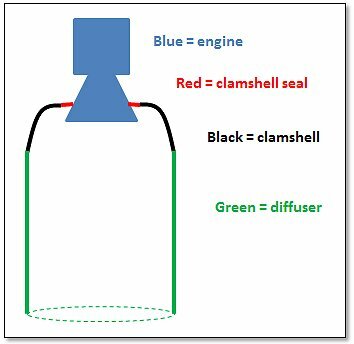 If you think of the thrust chamber assembly as what you use to make thrust, then the powerpack portion of the engine is what you use to feed the thrust chamber assembly. In other words, to be particular, it’s the gas generator, the turbopumps, and the full set of major control valves…plus, of course, the lines and ducts that connect everything together. 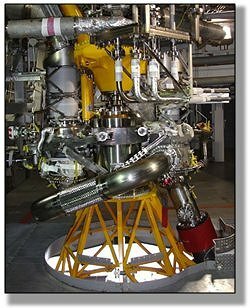 What this configuration allows you to do, far more so than the complete engine configuration, is “play games” with turbomachinery conditions and operations. And here’s why. 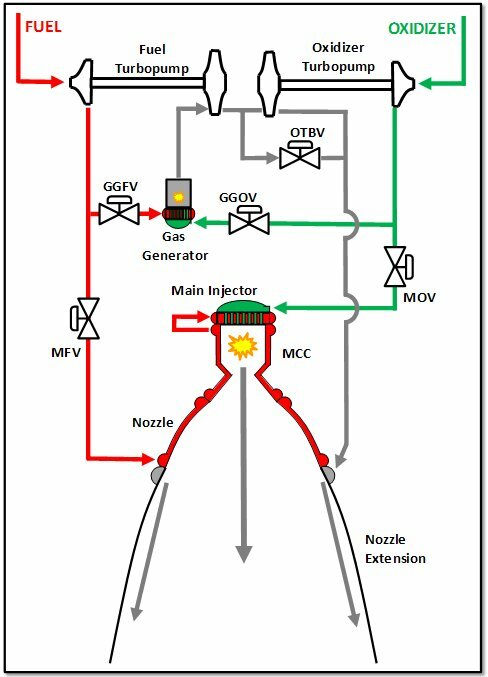 On the full engine configuration, you have to feed the thrust chamber assembly a pretty steady diet of fuel and oxidizer. If you deviate too far, things get too hot or too cold or you get too much pressure in the chamber or too little. 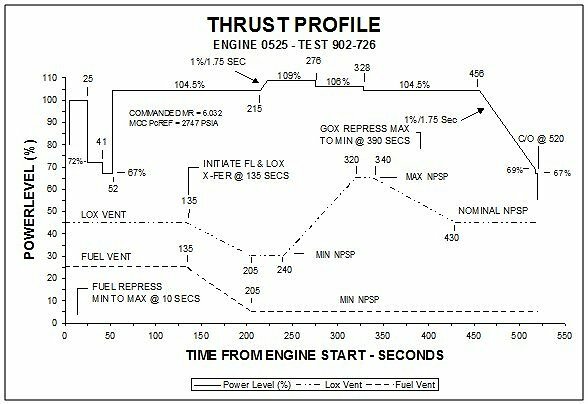 The thrust chamber assembly is a wonderful piece of equipment, astonishingly robust when functioning in their normal regimes, but it’s basically static and, to be honest, a bit persnickety when it comes to significantly off-nominal operations. So, you first get rid of the persnickety thrust chamber assembly to give yourself more flexibility and then, taking the next step, you get creative with the valves. On the complete engine configuration for flight, the J-2X engine has pneumatically actuated valves. 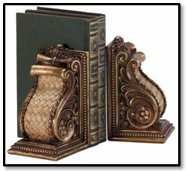 As we’ve discussed in the past, this means that they have two positions to which they are actuated: open and close. We can’t partially open or close them and hold them in intermediate positions thereby altering or directly controlling the propellant flows through the engine. But for powerpack, we’re not so constrained. For powerpack, we will use electro-mechanical valve actuators for the two gas generator valves (the GGFV and the GGOV) and we will use hydraulically-actuated facility valves to simulate the two main valves (the MFV and the MOV). All four of these valves will then no longer be simply open/close. They can be held as partially open or closed and, using these as control tools, we can vary temperatures, pressures, and flowrates throughout the powerpack. We can vary the power with which we drive the turbines. We can vary the downstream resistances seen by the pumps thereby altering the flows and pressure-rise profiles through the pumps. The OTBV — the valve that we normally use to alter engine mixture ratio by applying differential power levels to the two turbines — will not be actively actuated for the powerpack testing, but it will be configured such that we can alter its fixed, incremental position from test to test. 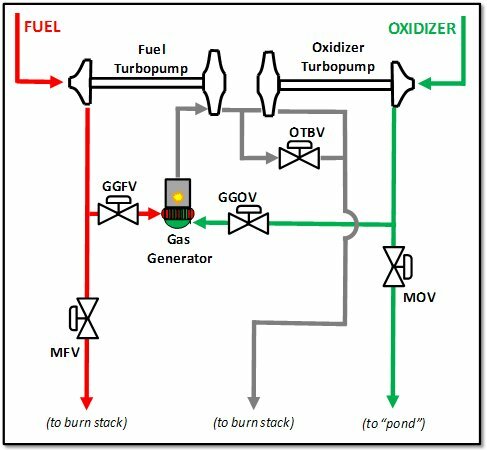 In that manner, we can use the OTBV position variations to explore inlet mixture ratio deviations on powerpack that the full engine configuration simply couldn’t tolerate. Thus, the powerpack assembly configuration is first and foremost (though not exclusively) a test bed for the turbomachinery. Just as with the “bomb test” philosophy discussed in the previous article, we already know that the J-2X engine works, but now we need to further explore the detailed implications of the design. We need to anchor and validate our analytical models, demonstrate operations across the spectrum of boundary conditions and environments, better characterize our margins, and exercise the full slate of design features and operational capabilities. The powerpack assembly test series is one very important means for doing this. Okay, so it’s a useful test article, but where does the actual Powerpack Assembly 2 stand? 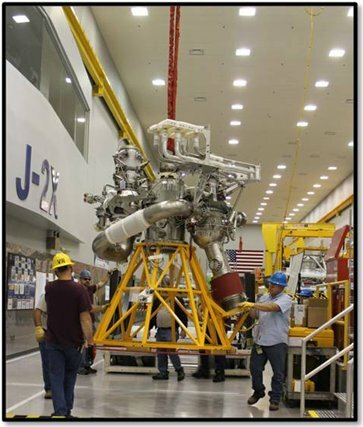 Well, while we’ve all been heavily (and appropriately) focused on the testing of J-2X development engine E10001, our contractor, Pratt & Whitney Rocketdyne, has been also quietly assembling Powerpack Assembly 2 back in the engine assembly area. Here is a picture of the complete Powerpack Assembly 2. It kind of looks like an engine, almost, doesn’t it? Well, that’s because we assembled it kind of like an engine but used a “dummy” thrust chamber assembly. You should recognize the yellow thing that looks like a cage. That’s the nozzle simulator that we used early on in the assembly of E10001. Sitting on top of the nozzle simulator is a simulated main combustion chamber and a simulated main injector. 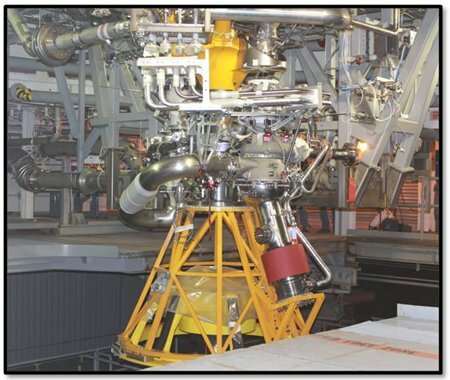 By making it look so much like a regular J-2X engine, it allows us to install the PowerPack Assembly 2 into the test stand much like we do a regular engine. 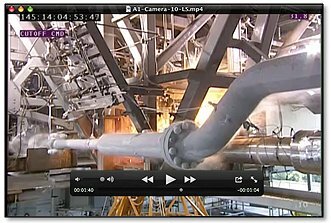 The only special adaptations are lines to catch the propellants coming out from the pumps and the discharge coming from the turbines. In a regular, full configuration engine all of these flows get routed through the thrust chamber assembly to produce thrust. For PowerPack Assembly 2 testing, these fluid streams are collected and disposed of off of the test stand. 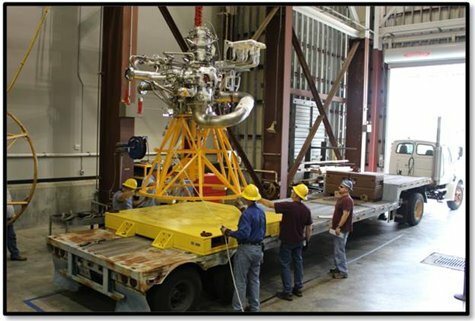 Next is a picture of the PowerPack Assembly 2 being carefully loaded onto the truck to transport it out to the test stand. Road trip! PowerPack Assembly 2 will be tested on test stand A-1, which is the sister test stand to A-2 where E10001 is currently being tested. 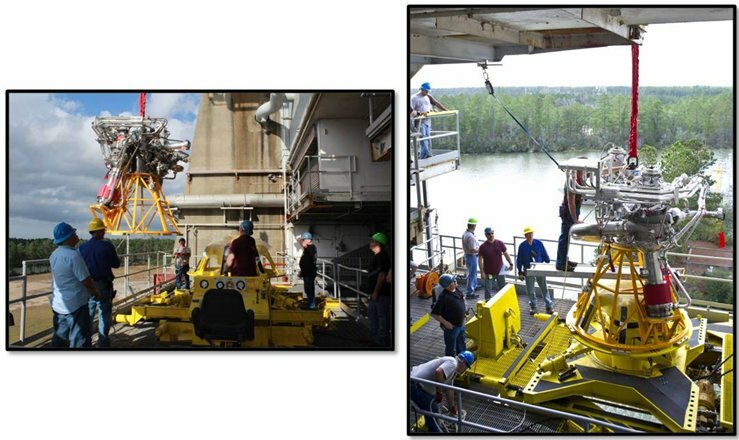 Here, below, are a couple of pictures of PowerPack Assembly 2 being lifted onto and then sitting on “the porch” of A-1. In the background you can see a portion of the canals that weave in and around the big test stands at the NASA Stennis Space Center. Nowadays, these canals are mostly used just to transport barges full of propellants. But back in the Apollo era, these canals were used to transport whole rocket stages in and out of the test facilities since they were too big for trucking. And here, is Power Pack Assembly 2 installed into the test position on stand A-1. Many kudos should be extended to our diligent contractor Pratt & Whitney Rocketdyne and our faithful partners at the NASA Stennis Space Center for making this milestone possible. Great work guys! Now, getting back to that other question regarding the “2” part of “PowerPack Assembly 2.” That denotation is simply there because this is the second powerpack assembly we’ve tested as part of the J-2X development effort. PowerPack Assembly 1 testing was conducted about four years ago using residual hardware from the XRS-2200 (linear aerospike) development project. While that first PowerPack Assembly did not use any true J-2X hardware since that hardware was not yet designed or built, it did help inform the J-2X turbomachinery designs. It used what were essentially J-2S turbopumps to explore J-2X-like operating regimes. The J-2X turbopump designs then began with the J-2S designs and made the changes necessary to fulfill the J-2X mission. 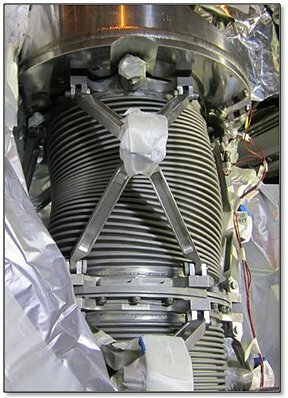 Another way of looking at this is that PowerPack Assembly 1 was used to inform the design and PowerPack Assembly 2 will be used to validate and characterize the design. To me, this sounds like a very nice pair of bookends on either side of the J-2X turbomachinery development effort.